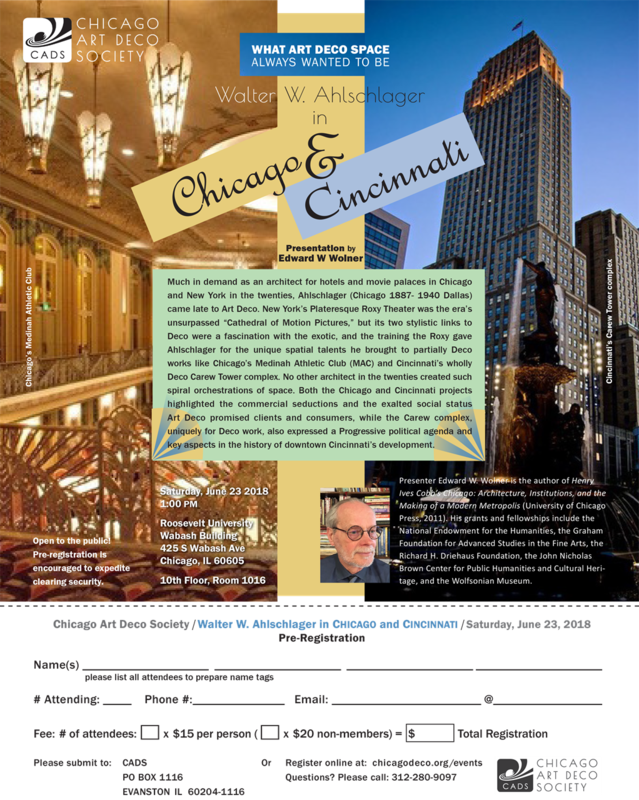 Much in demand as an architect for hotels and movie palaces in Chicago and New York in the twenties, Ahlschlager (Chicago 1887- 1940 Dallas) came late to Art Deco. New York’s Plateresque Roxy Theater was the era’s unsurpassed “Cathedral of Motion Pictures,” but its two stylistic links to Deco were a fascination with the exotic, and the training the Roxy gave Ahlschlager for the unique spatial talents he brought to partially Deco works like Chicago’s Medinah Athletic Club (MAC) and Cincinnati’s wholly Deco Carew Tower complex. No other architect in the twenties created such spiral orchestrations of space. Both the Chicago and Cincinnati projects highlighted the commercial seductions and the exalted social status Art Deco promised clients and consumers, while the Carew complex, uniquely for Deco work, also expressed a Progressive political agenda and key aspects in the history of downtown Cincinnati’s development.